Smooth covers are ideal for jobs that do not require a non-skid tread. Made from spunbound polypropylene that is sewn together instead of glued, offering greater strength. Latex-free. Dynarex blue shoe cover with an elastic band for a snug comfortable closure. 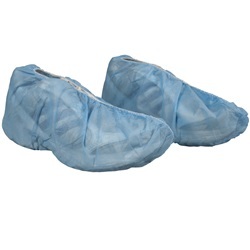 Universal in size, fitting shoes small to large, non-conductive, and sold 100 per box.